I was six years old when I saw my first horror movie and it was all by accident. 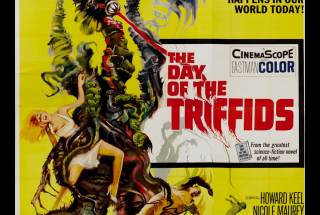 The film was THE DAY OF THE TRIFFIDS—and it was amazing. I’d woken up in the middle of the night and I’d come downstairs to get a drink. On my way back to bed, I peaked in on my mum in the living room who was watching TV. She had her back to me and hadn’t heard me in the kitchen. The movie she was watching was partway through and I couldn’t tell what she was watching. Instead of speaking up, I was transfixed by the images. Lurid yellows and greens bathed the screen. A night watchman was making his way through a botanic garden late at night. As he wandered by the plants, one of the plants broke out free of its flowerbed and attacked the night watchman. Eek!! The sight almost blew me out of my jimjams. I knew I’d walked in on something I shouldn’t be watching, but instead of sneaking out, I kept watching from the corner of the room. As the marauding planets gained took over Britain, I watched the carnage in slack jawed silence because I knew if my mum caught watching, I’d be told to go to bed and I didn’t want that. I had to see this thing through. So to ensure that I didn’t get my marching orders, I crawled on hands and knees and hid behind my mum’s armchair and took in the whole movie by peering from behind it. When the scares came, I clamped my hands over my mouth to keep the squeals in. My Seal Team Six attempt to blend into the background lasted until the end of movie and my mum caught me trying to sneak away during the final credits. She sat me down and asked me how much of the movie I’d seen and what I’d thought. She was testing my scared level. 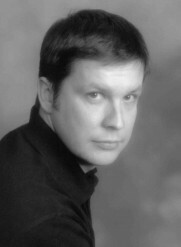 At this time I was a kid who watched Doctor Who from behind the sofa and there was one rule in our house: if I was scared I wasn’t allowed to watch Dr. W. I had to admit that the Triffids were the scariest thing I’d ever seen, but I was pretty certain I wasn’t going to have any bad dreams over it. I have to say all this was said with quite a lot of bravado behind it, because I have to strong fear of carnivorous plants, even today. My mum ended our talk saying that I would probably have to be a little older before I saw another scary movie. This was something that couldn’t happen. I’d just seen my first horror movie and I was an instant fan and no one could get in the way of that and no one did. I grew up watching all the classic monster movies and the Hammer movies of the day thanks to the BBC’s Saturday Night Horror Double Bill that ran through the 70’s and the early 80’s, which has made me the horror aficionado that I am today. 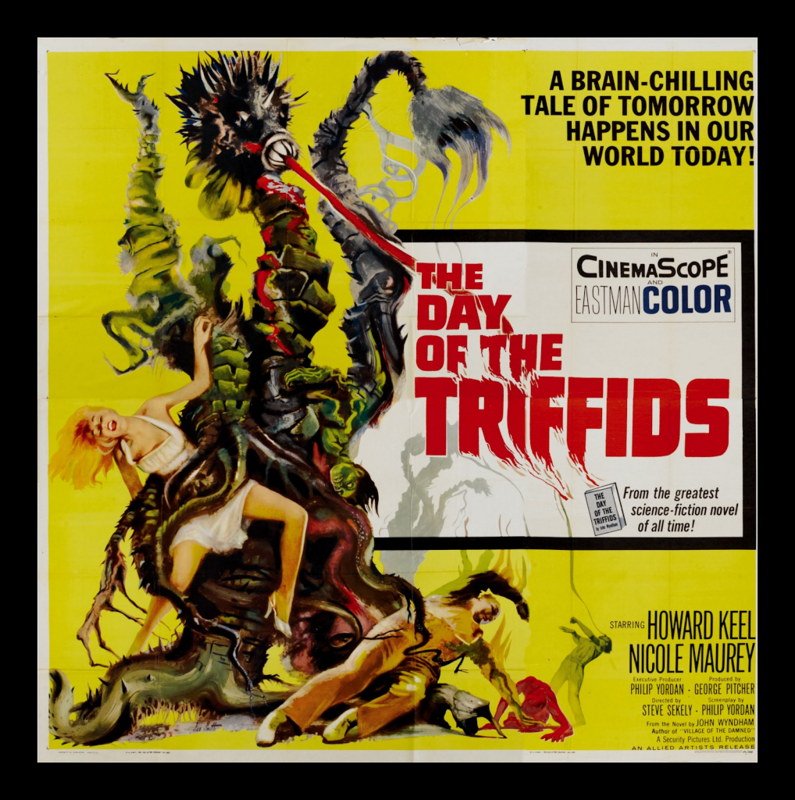 Nowadays, whenever THE DAY OF THE TRIFFIDS is on the TV, I have to watch. The movie doesn’t quite have the effect that it did when I was six. 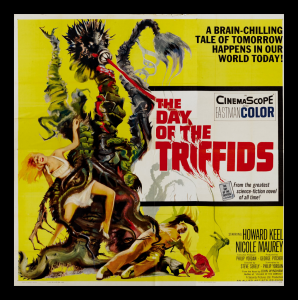 The scariest thing I find in the film is Howard Keel’s acting and not the alien flora, but the movie always produce a smile.